Last month, we were really excited to once again partner with the RSL & Services Clubs Association to bring another thought provoking and inspiring Leadership Symposium for 2018. 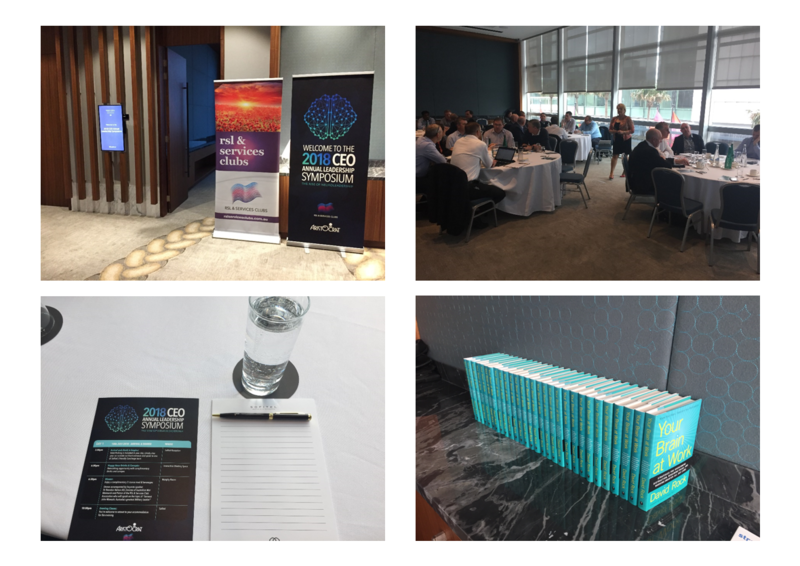 On 18th and 19th July, 28 CEO’s, General Managers and Secretary Managers from member clubs of the RSL & Services Clubs Association gathered at a beautiful, new facility, Sofitel Darling Harbour. We welcomed back those who have been with us along our 3-year journey and some first timers. We started out on this journey to create an opportunity to stimulate dialogue as thought leaders of the Club industry and this year’s symposium was no different in terms of our approach. These sessions were designed to help us think differently about our industry and to build a more sustainable pathway for the future. Just as important is that it is designed for us to come together in an informal environment and discuss the way forward, together. The Symposium started with an intimate dinner featuring keynote speaker Dr Brendan Nelson AO, Director of the Australian War Memorial and Patron of the RSL & Services Clubs Association. He inspired the attendees and spoke on the topic of “General John Monash, Australia’s greatest Military leader.” If you have ever had the pleasure of hearing Dr Brendan Nelson AO present, it is a truly special experience. Over the last 3 years, we’ve talked about how to best position ourselves for the future and practical strategies for staying ahead of the curve. We discussed how we stay ahead of the non-industry competition and develop practical strategies for avoiding obsolescence both from a venue and industry perspective. The journey so far has taken us from understanding digital disruption, to ensuring we remain relevant in a changing environment, and how to maximize the use of technology to be better connected with our customer. We thought that it was time for a change of pace this year and focus on our people. How do we successfully take our teams on the journey of change through new learning strategies? On the Thursday, we were joined by leading keynote speaker Karin Hawkins from the NeuroLeadership Institute in Australia, New Zealand and Asia. Karin discussed “The Rise Of NeuroLeadership” and how to use hard science to transform leadership effectiveness. We focused in on three key practices: Culture & Leadership, Diversity & Inclusion and Performance. Karin took us through the SCARF model to identify what drives and motivates us as individuals. There were plenty of light-bulb moments in the room. It suddenly made sense how individuals in our team and environment behaved based on the SCARF domains that were important to them. Whether it be status, certainty, autonomy, relatedness or fairness. Later in the afternoon, we covered off the SEEDS model of bias which includes Similarity, Expedience, Experience, Distance and Safety biases. We discussed where we saw each of the SEEDS biases play out in our teams and how to best mitigate the biases. Each of us took away tangible actions on how to break the bias, it was truly thought-provoking. This year’s symposium was a great experience for all those that joined. We all walked away feeling inspired to use Neuroleadership techniques upon our return to the office. If you would like to find out more about NeuroLeadership and the SCARF & SEEDS model, there are plenty of white papers available at https://neuroleadership.com. We look forward to partnering with the RSL & Services Clubs Association next year for another engaging event.